Google likes to put surprises on all Android OS. Since the launch of android lollipop, there has been a hidden mini game found inside. Android lollipop had some kind of flappy bird hidden game. Marshmallow had the same flappy bird style game but customized with marshmallow as obstacles and bird changed to android man. Now on their latest platform android 7.0 Nougat, Google decided to bring something new and fresh. The hidden game this time around is just like the popular Neko Atsume Kitty Collector game if you don’t know this, is a virtual cat collecting game. This game is easy to play. All you need to do is put a bait which could be fish, chicken or treat. Catch a cat when it comes to collect it. This game is definitely a fun time wasting activity. First, go to settings > About phone. Now tap the Android version about 5 times (do this action rapidly). When successful, you will see the Android Nougat N logo. Tap this logo 10 times then followed by long pressing the Android N.
When a cat emoji appears at the bottom of the N, that means the action is successful. Swipe down from the top of screen 2 times so as to open Quick settings panel. Tap edit button ( 3 dots on some devices). Scroll down to the end of the list, there is a tile with label “??? 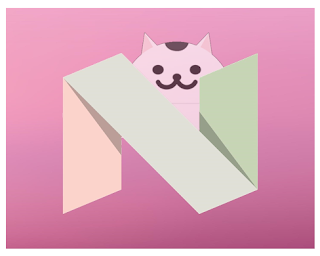 Android Easter Egg” with cat head. Press and hold this tile then drag it up to quick setting current tiles. You are done setting up the game. Tap on it and select and item ie chicken, fish, bits or treat. The Easter egg tile will change to the item you selected which acts as a bait. Just tap on the notification to get your new cat. To view and share any cat caught, press and hold the small cat icon. After catching any cat, the game tile at quick setting will change back to “Empty dish”. Keep repeating the bait process to catch other cats.